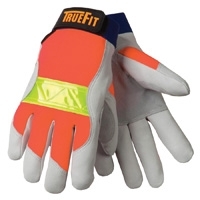 TrueFit Hi-Vis Thinsulate Lined Work Glove. Top grain pigskin leather palm double reinforced thumb, elastic cuff with hook and loop closure. 40gram Thinsulate lined glove WithYellow Reflective Strip. Available in Large & Xlarge.